Arsenal captain Laurent Koscielny is set to continue his comeback from injury by helping Arsenal U21s in their quest to progress in the Checkatrade Trophy. The young Gunners take on Portsmouth at Fratton Park tomorrow night, with Koscielny in line to play some part in the fixture as he edges closer to regaining full fitness. 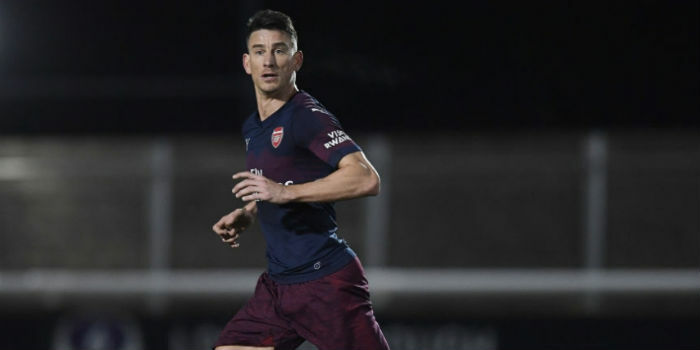 Koscielny played the first half as Arsenal U23s lost 5-0 to Derby County last week, but, despite the scoreline, he fared rather well, with only one goal being conceded while the Frenchman was on the field. During the game against Derby, Koscielny played alongside Danny Ballard at the heart of the defence, although Zech Medley, who featured for the first-team last week, will also be in contention to play against Portsmouth. Being able to play alongside an individual as experienced as Koscielny will undoubtedly be hugely beneficial for Arsenal’s youngsters and the Frenchman’s involvement could well prove useful in helping Freddie Ljungberg’s side to progress further in the competition. Having managed to get out of the group stages, Arsenal are now looking to go all the way in this competition, although at times they may have to cope without the services of some of their key players if they are required for first-team duty. Retaining the Premier League 2 title looks as if it will be a tough ask for Arsenal this season given their inconsistent results in the league, but the Checkatrade Trophy represents a chance for them to get some silverware. The likes of Tyreece John-Jules and Bukayo Saka, who travelled with the first-team in the Europa League, should have a significant part to play against Portsmouth as they seek to push on further and take the next steps in their development. It seems unlikely, though, that Emile Smith Rowe and Eddie Nketiah will be involved given how close they are to the first-team squad. Out of curiosity, how come our U23s got so spanked by Derby County? Anyone actually seen it? Aside the fact the Derby county side were home and are probably the best team in that competition, Arsenal’s side were severely depleted as the first team had a good number of the youngsters training all week towards the game in Ukraine vs Vorskla. Derby top the table in the division, if what I read is true. Emile Smith Rowe and Eddie Nketiah should definitely be involved in this game. Playing against experienced pros, away at a tough ground, against a team top of their league (though Pompey will likely rotate), will be a good learning curve for them. They won’t play at Old Trafford so it shouldn’t be an issue if they play in the Checkatrade game.